This Friday, January 27, is EITC Awareness Day, a day intended to promote the federal Earned Income Tax Credit (EITC) so that more workers with low and moderate incomes can benefit from this cash-back tax credit. Many groups here in California, the California Budget & Policy Center among them, will use this day to also get the word out about the state’s version of this tax credit — the CalEITC — which is available to claim for the second year (tax year 2016) since it was signed into law. To help groups gear up for EITC Awareness Day, here are some key facts to know about the CalEITC. The CalEITC increases working families’ economic security. The CalEITC is a refundable state tax credit that helps families who earn very little from work to better afford the basics. Families with children can receive as much as $2,706 from this credit, depending on how many children they are supporting. This is in addition to roughly $2,000 to $3,800 that families who qualify for the maximum CalEITC can receive from the federal EITC and Child Tax Credit (CTC). In this way, the CalEITC enhances the benefits of these federal tax credits. Families can see their incomes rise by as much as 92% thanks to the CalEITC, in combination with the federal EITC and CTC (see chart). The CalEITC builds on the success of the federal credit. The CalEITC piggybacks on the federal EITC, which has a long track record of helping working families make ends meet and increasing opportunities for children to move up the economic ladder. By encouraging and rewarding work, the federal EITC significantly boosts employment among single mothers, and together with the CTC, it lifts more children out of poverty than any other federal policy. Indeed, the federal EITC is the “cornerstone of US anti-poverty policy.” Moreover, the benefits of the credit can extend to the next generation. Children in families who receive the federal EITC tend to do better and go farther in school and can even earn more as adults. Research also links the credit to improved health for mothers and infants. Raising awareness of the CalEITC is key to its success. Promoting the new state EITC is critical to its success. This is not only because the credit is still relatively new, but also because it primarily targets workers who — due to their very low earnings — are not required to file state personal income taxes and may not realize that they can get cash back if they do. Community organizations, including the United Ways of California, as well as state and local government agencies, policymakers, and other stakeholders — like the Golden State Opportunity Foundation, which launched the CalEITC4me campaign — have worked hard to get the word out about the CalEITC. Thanks to these efforts, the first year of CalEITC claims were strong. It’s likely that roughly 63% to 83% of workers eligible for the CalEITC claimed the credit in its first year. (A more precise participation rate is not possible to determine because it’s not known exactly how many workers qualify for the credit.) By comparison, around 75% of Californians who are eligible for the federal EITC are estimated to claim it each year. Efforts to promote the CalEITC must be ongoing. Although first-year claims for the CalEITC were strong, it will be important to continue raising awareness of the credit so that a larger share of eligible workers benefit from it. Many people at the low-end of the income scale experience large swings in their incomes from year to year, which means that different workers may newly qualify for the credit each year. In addition, the Budget Center’s survey of over 900 county human services clients last fall found relatively low awareness of the credit. Fewer than 1 in 5 clients who were likely eligible for the CalEITC had even heard of the credit. Moreover, fewer than half of those likely eligible for the credit actually filed their taxes in the first year that it was available. This suggests that many people may have missed out on hundreds or even thousands of dollars in refunds from state and federal tax credits combined. These clearly are dollars that low-earning workers need. About 8 in 10 of our respondents who were likely eligible for the CalEITC reported experiencing at least one major hardship in 2015, including not having enough money for food, falling behind on the rent, and not being able to afford necessary medical care. Boosting participation in working-family tax credits is especially critical this year, given the likelihood of harmful federal policies. Policy changes expected under the Trump Administration will likely make it harder for families with low and moderate incomes to make ends meet. In turn, state policymakers will face difficult choices about how to prevent or reduce the harm, particularly given the magnitude of the threats on the federal front. One relatively low-cost strategy to mitigate some of the harm would be to maximize the number of eligible Californians who claim the federal EITC and CTC. Boosting claims for these tax credits would get additional federal dollars into the pockets of families who are likely to be hurt by actions taken in Washington. While this in no way would offset the damage caused by significant federal policy changes, such as the threatened repeal of the Affordable Care Act (ACA), it would at least provide some relief. 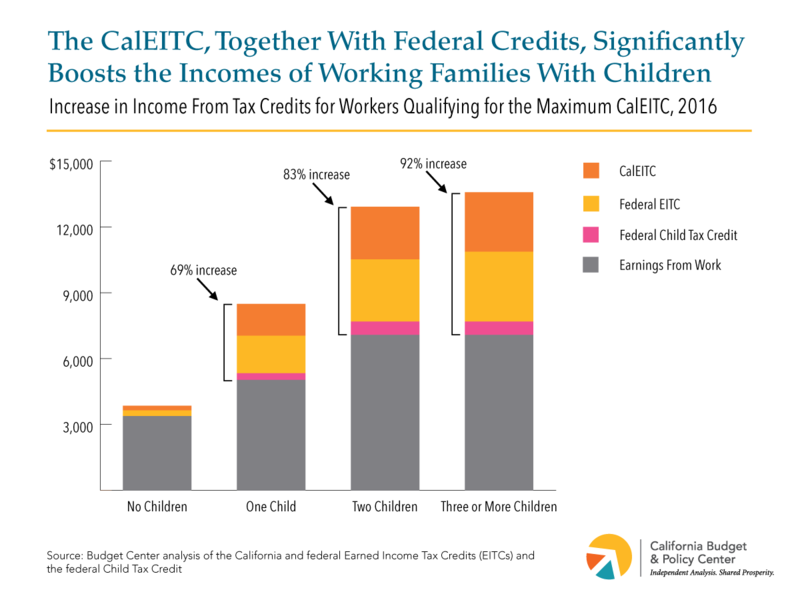 Promoting the CalEITC provides a perfect opportunity to also raise awareness of working-family tax credits that can bring additional federal dollars into the state. Based on our updated estimates, increasing CalEITC claims by just 5% (less than 19,000 additional households) could draw more than $30 million in additional federal funds into the state from the federal EITC alone. And because these are dollars that low-earning households would likely spend in their communities, they would give a boost to local businesses and the economy, especially in places likely to be hit hardest by federal policy changes. With people in communities throughout California still facing significant economic challenges, and with the looming prospect of cuts to federal supports for low-income households, state policymakers must do more to help Californians advance economically. Raising awareness of state and federal working-family tax credits to maximize participation in them, promoting free tax preparation services so that tax filers get the full benefit of their refunds, and gradually expanding the CalEITC to more workers are commonsense steps California could take to provide additional support to workers struggling to make ends meet.